non-negligible bias when the sample size T is not large. noise is proposed in . noise can be represented by an ARMA(1, 1) process. and  to avoid this problem. proposed IV estimator using simulations. 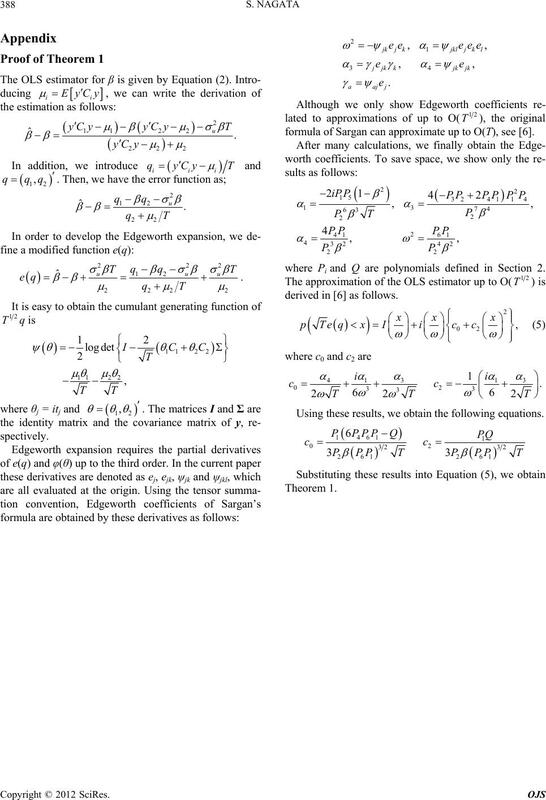 Then, we obtain the following theorem. Proof. The proof is given in Appendix. 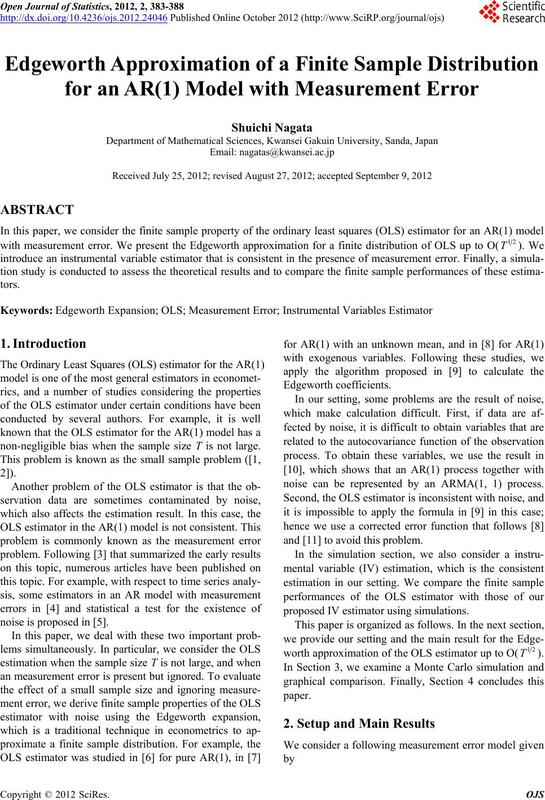 the asymptotic variance of the OLS estimator is 1 – β2. 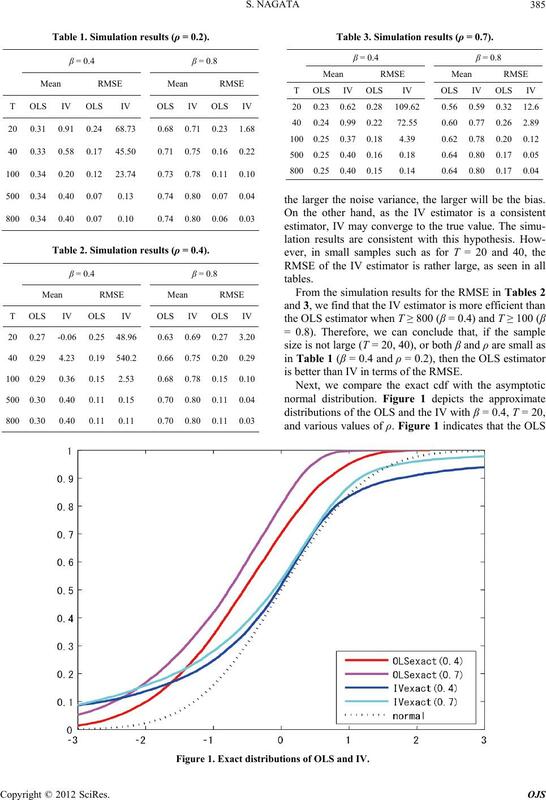 IV estimator in the absence of noise. bution generated in Section 2 by Monte Carlo simulation. are summarized in Tables 1-3. Table 3. Simulation results (ρ = 0.7). Table 1. Simulation results (ρ = 0.2). the larger the noise variance, the larger will be the bias. Table 2. Simulation results (ρ = 0.4). is better than IV in terms of the RMSE. Figure 1. Exact distributions of OLS and IV. Figure 2. Exact and approximate distributions of OLS. Figure 3. Exact and approximate distributions of OLS. shape of the OLS distribution. dealt with in a future study. Autocorrelation,” Biometrika, Vol. 41, No. 3-4, 1954, pp. can Statistical Association, Vol. 100, No. 471. 2005, pp. ory, Vol. 18, No. 2, 2002, pp. 278-296. 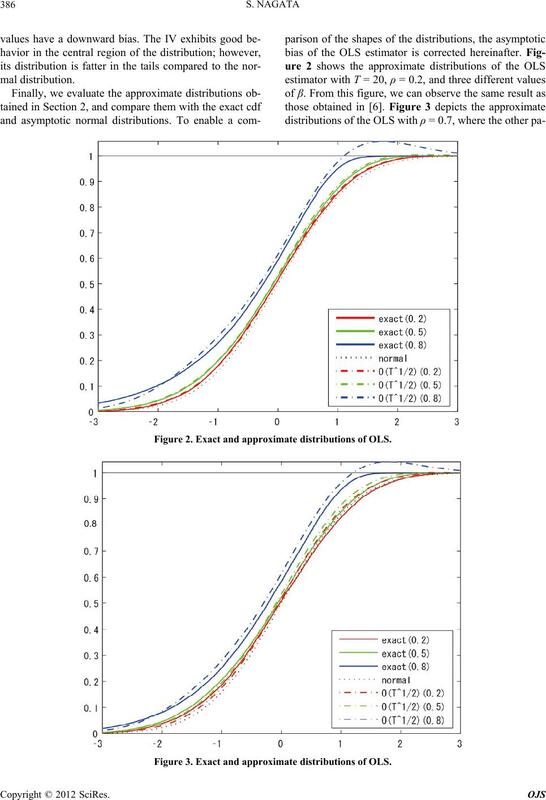 AR(1) Model with Unknown Mean,” Econometrica, Vol. 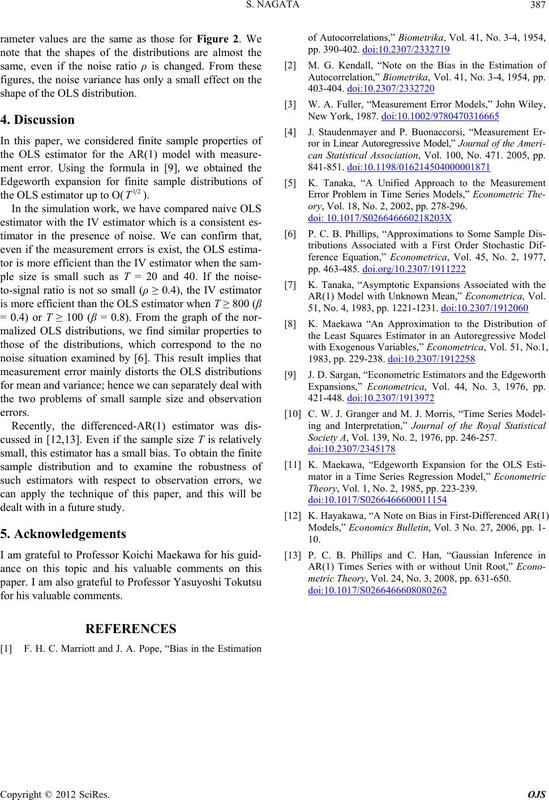 Expansions,” Econometrica, Vol. 44, No. 3, 1976, pp. Society A, Vol. 139, No. 2, 1976, pp. 246-257. Theory, Vol. 1, No. 2, 1985, pp. 223-239.
metric Theory, Vol. 24, No. 3, 2008, pp. 631-650.
formula of Sargan can approximate up to O(T), see . where Pi and Q are polynomials defined in Section 2. 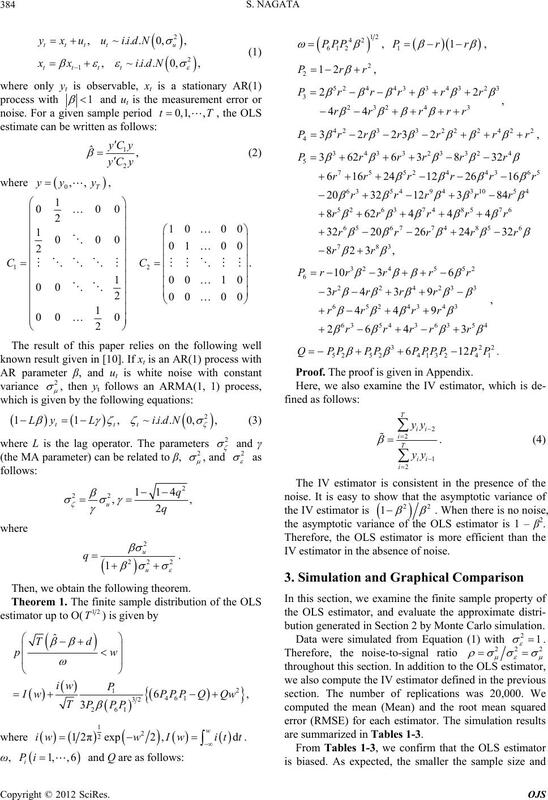 Using these results, we obtain the following equations.